This 2-car, 580 square foot garage replaces an interlocking brick laneway parking pad. 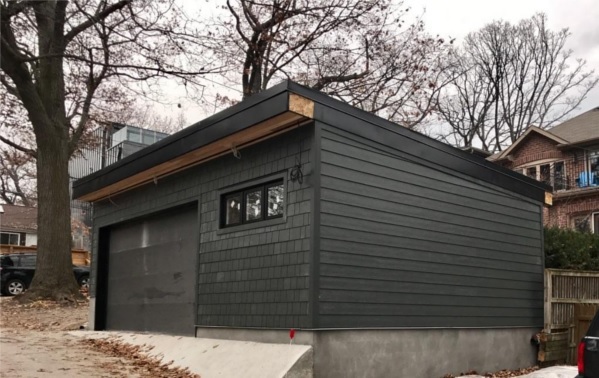 Desiring a more modern aesthetic and limited in height due to city by-laws, a low-slope shed style roof was chosen for this garage. A block curb was fastened to the perimeter of the floating slab foundation to help protect the wood studs from any future wet conditions on the slab. Cement board siding in both shake panels and smooth planks clads the exterior while a waterproof membrane replaces shingles for the roof finish. Committee of adjustment (CoA) approval was required for an increase in gross area, to locate the front edge of the garage closer to the laneway than permitted, and to allow for an exception to minimum soft landscaping requirements.